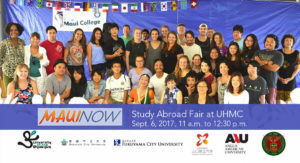 The University of Hawaiʻi Maui College and its International Office invite the public to learn and consult with representatives from participating universities from Japan, the Czech Republic and the Philippines at the upcoming Study Abroad Fair. The event will take place on Wednesday, Sept. 6, 2017, from 11 a.m. to 12:30 p.m., in the Pā‘ina Building at the University of Hawai‘i Maui College campus in Kahului. 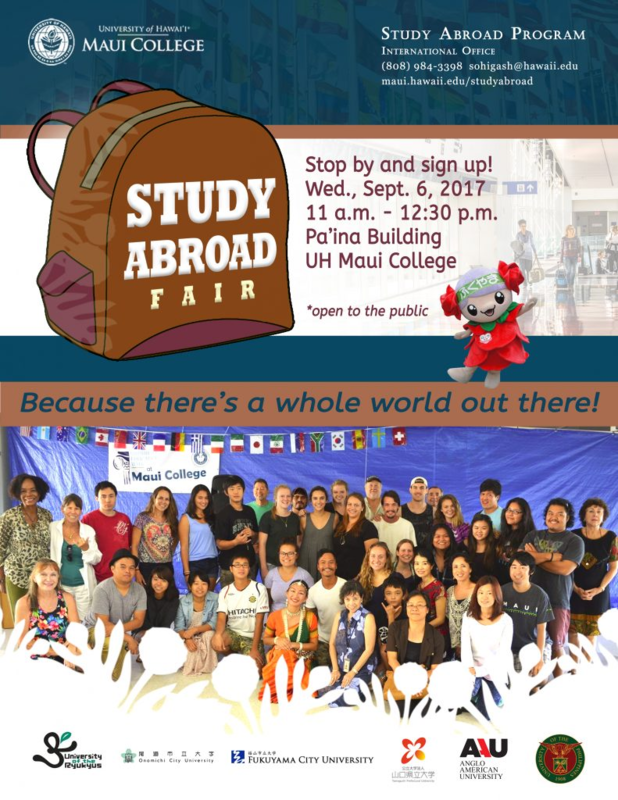 The Study Abroad Fair takes place on Wednesday, Sept. 6, 2017, from 11 a.m. to 12:30 p.m., in the Pā‘ina Building, at the University of Hawai‘i Maui College. Click image to view in greater detail. Participating universities include Japan’s University of the Ryukyus, Onomichi City University, Fukuyama City University, Czech Republic’s Anglo-American University in Prague and the University of the Philippines. Faculty and students from Japan’s Yamaguchi Prefectural University will also be present to answer questions about expectations in studying abroad, specifically about their Summer Global Program 2018. In addition, UH Maui College representatives will provide information on how to apply for UHMC’s International Mobility Ready (I.M. Ready) 2018 summer program to the Philippines, which will cover students’ airfare and accommodations. Officials said that because of more affordable airfare, and partnerships with universities and housing options, there is increased interest in studying abroad. UH Maui College’s International Office is also planning a brown bag speaker series to encourage people to apply for its Study Abroad program. The Office aims to develop bridges, in partnership with the Maui County Sister Cities Foundation, that will connect students from Maui and abroad to develop meaningful relationships furthering their career goals. For inquiries about the Study Abroad Fair, contact Stephanie at sohigash@hawaii.edu.